Cochlear implantation has become a routine procedure in the United States and worldwide for the management of severe-to-profound sensorineural hearing loss. It is a remarkable example of success that was made possible through collaboration between engineers, surgeons, scientists and the medical community. As of 2012, more than 300,000 implants have been performed worldwide. The decision to embark upon cochlear implantation is made either by the patient (if adult) or by the parents or caregivers of a child. This procedure is well tolerated and routinely performed on an outpatient basis in both adults and children. The team concept in cochlear implant evaluation allows for an exchange of information between the surgeon and other members of the implant and rehabilitation process, including audiologists, speech and language therapists, social workers, and psychologists. Typically, the patient is referred to a cochlear implant center, and initial contact is made. The patient may first be seen and identified as an implant candidate by an audiologist. Hence, a patient can enter the evaluation process in a number of different ways. Nonetheless, various issues are taken into consideration, including medical aspects of the patient's history, the audiologic evaluation, radiographic studies, and overall expectations of patient and involvement of family (in pediatric patients) in a rigorous rehabilitative process. An image depicting cochlear implant surgery can be seen below. Postauricular incision for cochlear implant. Although the team evaluation concept is explained at greater length in the Indications section, it is notable because it allows for proper selection of patients, the continuous flow of pertinent dialogue, and the promotion of realistic expectations on the part of the patient and the patient's family. The evaluation process used by the authors at the implant center at the Cleveland Medical Center/University Hospitals of Cleveland and Rainbow Babies and Children's Hospital is summarized below. At the time of the medical evaluation, the patient's general medical history and issues regarding hearing loss are reviewed. A complete neuro-otologic and otolaryngologic examination is performed, and obvious conditions (eg, tympanic membrane perforation, chronic otitis media, congenital anomalies) are noted. The patient's history is reviewed to establish the potential etiology of the hearing loss. Audiologic tests are reviewed and repeated as necessary. Once the patient is deemed to be a potential cochlear implant candidate, the various cochlear implant options are discussed, and audiologic evaluation commences. Typically, the audiologist measures the patient's hearing with and without hearing aids. Evaluation with pure-tone audiometry and auditory brainstem response (ABR) testing (in the case of children) is often performed. Otoacoustic emission (OAE) testing complements these studies; OAE results often indicate the need for a trial of newer and sometimes stronger hearing aids. A CT scan is obtained to evaluate the bony anatomy of the cochlea and to establish the presence of a patent (nonossified) cochlear duct. It is also used to identify various anomalies of cochlea-vestibular anatomy (common cavity, incomplete partition defects, enlarged vestibular aqueduct, and cochlear ossification. In some cases, an MRI is used instead of the CT when questions exist regarding the presence of the eight nerve or severe ossification. In children and young adults, speech and language evaluation and educational placement discussions are performed next. Finally, a psychosocial evaluation is completed. Once a patient has been evaluated, a team meeting commences to recommend cochlear implantation advice. If the patient is cleared for cochlear implantation, the patient proceeds with preoperative medical clearance, chooses a cochlear implant device, and proceeds with surgery. In 1957, Djourno and Eyries made the observation that activation of the auditory nerve with an electrified device provides auditory stimulation in a patient. This observation is considered the seminal observation that paved the way for modern cochlear implantation. In 1963, Doyle and Doyle's early experiments in scala tympani implantation preceded the first House/3M single-channel implant in 1972. [1, 2] Multichannel devices introduced in 1984 have replaced single-channel devices by virtue of improved speech recognition capabilities. As of 2012, nearly 300,000 cochlear implants are estimated to have been performed worldwide, and approximately 7,000 procedures take place annually in the United States. Three US Food and Drug Administration (FDA)–approved multichannel devices are routinely used in the United States currently, including the Nucleus 5 cochlear implant system (Cochlear Corporation), the Clarion HiRes 90K (Advanced Bionics Corporation), and the Synchrony device (MED-ELCorporation). Severe-to-profound hearing loss, as evidenced by the lack of useful benefit from hearing aids, often determines one's candidacy for cochlear implantation. In children, this is confirmed via auditory testing and failure to develop basic auditory skills. In adults, candidates should receive limited or no benefit from appropriate hearing aids used for 3 months (ie, a score of 50% or less on sentence recognition tests in the best-aided listening situation). Expanded indications include the use of hybrid devices (with preserved hearing in low frequencies) which have more specific audiometric criteria,  implantations in pediatric patients less than 12 months of age, and off-label use for unilaterial hearing loss with or without bothersome tinnitus. Common etiologies of deafness that lead to consideration of cochlear implantation in pediatric patients include idiopathic, genetic, and acquired causes that result in congenital and delayed-onset hearing loss. Genetic hearing loss can be dominant or recessive. Infectious etiologies, including bacterial and postviral meningitis, can lead to severe hearing loss. Meningitis-related deafness has decreased with the routine use of the Haemophilus influenzae vaccine in children. Adult patients presenting for implantation include those with progressive hearing loss that began in childhood, viral-induced sudden hearing loss, ototoxicity, otosclerosis, Ménière disease, trauma, autoimmune conditions, presbycusis, and bacterial infections. In the past, children with hearing loss presented to the physician after their parents developed a concern about their child's lack of response to noise and voices. This may have brought the child to the attention of an otolaryngologist promptly (within a few weeks to months), or consultation may have been delayed up to a number of years. With the addition of universal infant screening, babies are identified at birth as having a hearing loss. The loss is confirmed and quantified with ABR and OAE testing and if profound, the patient is referred for cochlear implant evaluation. Children are fitted with hearing aids, and a decision to implant is based on progress or lack of language development and careful counseling of the family. If a child is clearly found to be an implant candidate, an earlier implantation results in superior hearing and speech outcomes. Thus, implantation at age 12 months is now considered ideal, and, in some instances, implantation at an earlier age is performed. Adults with progressive loss that ultimately fails to be managed via amplification also may present for implant consideration. Patients are increasingly informed of the various options for cochlear implantation via the Internet and often have specific questions regarding different device options. For excellent patient education resources, visit eMedicineHealth's Ear, Nose, and Throat Center. Also, see eMedicineHealth's patient education article Hearing Loss. Children are considered candidates for cochlear implantation at age 12 months, and, because of meningitis-related deafness with progressive cochlear ossification, occasional earlier implantation is necessary. Investigations are ongoing into extending the age of early routine implantation to younger than 12 months. Audiologic criteria include severe-to-profound sensorineural hearing loss bilaterally and poor speech perception under best-aided conditions, with a failure to progress with hearing aids and an educational environment that stresses oral communication. The use of objective testing in this age group includes auditory brainstem response (ABR) testing and otoacoustic emission (OAE) testing in addition to trials of various auditory training programs, which are essential before cochlear implantation. For further discussion, see the Medscape Reference article Indications for Cochlear Implants. The surgeon performing cochlear implant surgery must be experienced in otologic surgery and, ideally, some aspects of neurotologic surgery. Intimate knowledge of the relevant surgical anatomy of the mastoid cortex, retromastoid region, high riding jugular bulb, and posterior/middle cranial fossa dura is important in properly performing the approach to the facial recess and in properly creating an implant receiver well that provides low-profile placement of the internal device. For more information about the relevant anatomy, see Auditory System Anatomy, Skull Base Anatomy, and Facial Nerve Anatomy. Contraindications to cochlear implantation may include deafness due to lesions of the eighth cranial nerve or brain stem. In addition, chronic infections of the middle ear and mastoid cavity or tympanic membrane perforation can be contraindications. Cochlear aplasia as demonstrated on CT scans remains an absolute contraindication. Certain medical conditions that preclude cochlear implant surgery (eg, specific hematologic, pulmonary, and cardiac conditions) also may be contraindications. The lack of realistic expectations regarding the benefits of cochlear implantation and/or a lack of strong desire to develop enhanced oral communication skills poses a strong contraindication for implant surgery. The rigorous implant candidacy criteria and process helps to select prospective patients who will yield the greatest benefit from it. Various institue-specific online and device-specific literature is available and is discussed with the patients and families at the time of initial evaluation and device selection. In addition, advocacy groups such as the American Cochlear Implant Alliance provide further information and resources for further utilization of implantation for hearing loss. Doyle J, Doyle D. Electrical stimulation of the nerve deafness. Bulletin of the Los Angeles Neurological Society. 1963. 28:148-150. House WF, Urban J. Long term results of electrode implantation and electronic stimulation of the cochlea in man. Ann Otol Rhinol Laryngol. 1973 Jul-Aug. 82(4):504-17. [Medline]. Mowry SE, Woodson E, Gantz BJ. New frontiers in cochlear implantation: acoustic plus electric hearing, hearing preservation, and more. Otolaryngol Clin North Am. 2012 Feb. 45 (1):187-203. [Medline]. Van Naarden K, Decoufle P, Caldwell K. Prevalence and characteristics of children with serious hearing impairment in metropolitan Atlanta, 1991-1993. Pediatrics. 1999 Mar. 103(3):570-5. [Medline]. Goman AM, Reed NS, Lin FR. Addressing Estimated Hearing Loss in Adults in 2060. JAMA Otolaryngol Head Neck Surg. 2017 Jul 1. 143 (7):733-734. [Medline]. Linthicum FH Jr, Fayad J, Otto SR, et al. Cochlear implant histopathology. Am J Otol. 1991 Jul. 12(4):245-311. [Medline]. Seyyedi M, Viana LM, Nadol JB Jr. Within-subject comparison of word recognition and spiral ganglion cell count in bilateral cochlear implant recipients. Otol Neurotol. 2014 Sep. 35 (8):1446-50. [Medline]. Quesnel AM, Nakajima HH, Rosowski JJ, Hansen MR, Gantz BJ, Nadol JB Jr. Delayed loss of hearing after hearing preservation cochlear implantation: Human temporal bone pathology and implications for etiology. Hear Res. 2016 Mar. 333:225-234. [Medline]. National Institutes of Health. NIH Consensus Statement. Cochlear Implants in Adults and Children. 1995, May15-17. 13(2):1-30. Evaluation of Revised Indicatons (ERID) for Cochlear Implant Candidacy for the Adult CMS Population. ClinicalTrials.gov. Available at https://clinicaltrials.gov/ct2/show/NCT02075229. Accessed: October 13, 2017. Biernath KR, Reefhuis J, Whitney CG, et al. Bacterial meningitis among children with cochlear implants beyond 24 months after implantation. Pediatrics. 2006 Feb. 117(2):284-9. [Medline]. Balkany T, Telischi FF. Fixation of the electrode cable during cochlear implantation: the split bridge technique. Laryngoscope. 1995 Feb. 105(2):217-8. [Medline]. Tambyraja RR, Gutman MA, Megerian CA. Cochlear implant complications: utility of federal database in systematic analysis. Arch Otolaryngol Head Neck Surg. 2005 Mar. 131(3):245-50. [Medline]. Rubinstein JT, Gantz BJ, Parkinson WS. Management of cochlear implant infections. Am J Otol. 1999 Jan. 20(1):46-9. [Medline]. Gantz BJ, Tyler RS, Knutson JF, et al. Evaluation of five different cochlear implant designs: audiologic assessment and predictors of performance. Laryngoscope. 1988 Oct. 98(10):1100-6. [Medline]. Das S, Buchman CA. Bilateral cochlear implantation: current concepts. Curr Opin Otolaryngol Head Neck Surg. 2005 Oct. 13(5):290-3. [Medline]. Roland JT Jr, Zeitler DM, Jethanamest D, et al. Evaluation of the short hybrid electrode in human temporal bones. Otol Neurotol. 2008 Jun. 29(4):482-8. [Medline]. Mastoidectomy has been performed, as well as facial recess approach. Attention is now turned to marking the site for implant-well drilling. Tie-down holes have been created and 2-0 nonabsorbable sutures have been placed through 1-mm holes drilled into the ledge of bony well. Cochleostomy is performed (upper left hand corner) prior to placing implant into receiver well (main photo). Once electrodes are placed into cochleostomy and extracochlear electrode lead is placed under temporalis muscle, closure of periosteal tissue can begin. 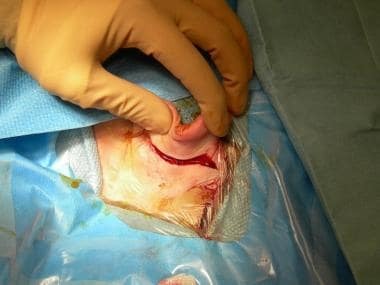 A water-tight periosteal closure is performed, and skin closure begins with a subcutaneous absorbable suture line. Implant well is drilled down to the dura. Cochlear Implant is secured into the skull via suture. The ground electrode is placed under the temporalis muscle and the electrode array is inserted into the scala tympani. The stylet is then removed.